Grand Oaks Recreation Center is the site of the Grand Oaks Active Senior Center, Dance Classes, Tot Open Gym and many other programs and special events throughout the year. The building including program rooms and large auditorium area are available for community rentals. 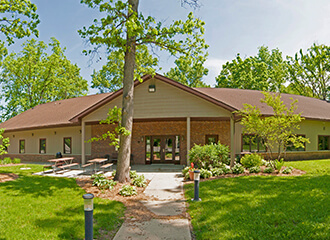 Set in a wooded area just off Route 176, the building has been extensively renovated through the years and now features dedicated dance rooms, auditorium area with elevated stage and wood-look floors plus several rooms dedicated to the Grand Oaks Active Adult Center including a lounge area, art room and game area. 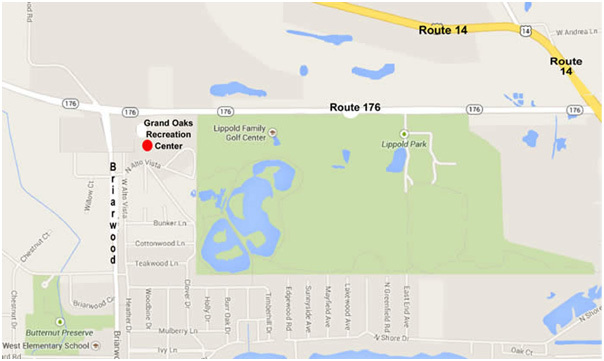 Grand Oaks Recreation Center is located at 1401 W. Route 176, Crystal Lake. This address is not located by most GPS units. The best way to locate Grand Oaks via GPS is to plug in "Briarwood & Route 176" and then hit search on GPS, you can get correct directions to that intersection. Grand Oaks is on the Southeast corner of that intersection. Grand Oaks is open during scheduled programs and there are waiting areas for martial arts, fitness programs and dance programs. Please see the current brochure for class info and times. Grand Oaks Recreation Center auditorium, a small kitchen and program rooms are available for public and community group rentals. Contact Lauren Thibodeau at 815.459.0680 ext.1226 or email lthibodeau@crystallakeparks.org.